In the short run, a firm operating at a loss [R < TC (revenue less than total cost) or P < ATC (price less than unit cost)] must decide whether to continue to operate or temporarily shut down. The shutdown rule states "in the short run a firm should continue to operate if price exceeds average variable costs". Restated, the rule is that for a firm to continue producing in the short run it must earn sufficient revenue to cover its variable costs. The rationale for the rule is straightforward: By shutting down a firm avoids all variable costs. However, the firm must still pay fixed costs. Because fixed costs must be paid regardless of whether a firm operates they should not be considered in deciding whether to produce or shut down. Thus in determining whether to shut down a firm should compare total revenue to total variable costs (VC) rather than total costs (FC + VC). 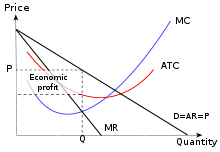 If the revenue the firm is receiving is greater than its total variable cost (R > VC), then the firm is covering all variable costs and there is additional revenue ("contribution"), which can be applied to fixed costs. 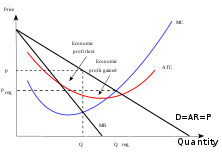 (The size of the fixed costs is irrelevant as it is a sunk cost. The same consideration is used whether fixed costs are one dollar or one million dollars.) On the other hand, if VC > R then the firm is not covering its production costs and it should immediately shut down. 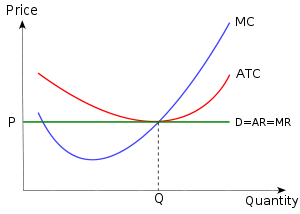 The rule is conventionally stated in terms of price (average revenue) and average variable costs. The rules are equivalent (if one divides both sides of inequality TR > TVC by Q gives P > AVC). 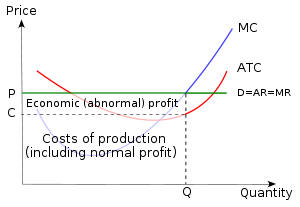 If the firm decides to operate, the firm will continue to produce where marginal revenue equals marginal costs because these conditions insure not only profit maximization (loss minimization) but also maximum contribution. Another way to state the rule is that a firm should compare the profits from operating to those realized if it shut down and select the option that produces the greater profit. A firm that is shut down is generating zero revenue and incurring no variable costs. However, the firm still has to pay fixed cost. So the firm's profit equals fixed costs or −FC. An operating firm is generating revenue, incurring variable costs and paying fixed costs. 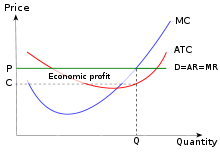 The operating firm's profit is R − VC − FC. The firm should continue to operate if R − VC − FC ≥ −FC, which simplified is R ≥ VC. The difference between revenue, R, and variable costs, VC, is the contribution to fixed costs and any contribution is better than none. Thus, if R ≥ VC then firm should operate. If R < VC the firm should shut down.